First off I want to say a heartfelt thank you for everyone that took part in the Invisible Diseases Awareness campaign and I am so tickled that some of the information I provided has helped some readers. That was an uplifting blessing that I was really needing and I am so happy I was able to help! I’ve been struggling with some issues due to treatments not working so well for me lately, so I haven’t been posting, but I have had a lifted heart following the awesome feedback from the Awareness post. Today I thought I’d share a little concept that I think is absolutely brilliant, yet is so simple and versatile that I think it could be useful to almost everyone. I was reading something from Pinterest, which had a link to this site, which had a link to that site, and then I was down the Internet’s rabbit hole until I somehow landed on the Creative with Kids blog. Her post (I put the direct link to what I’m referencing for her blog URL) was about better communication and less anger with/between her kids (I’ll wait here while you go read the post….welcome back! *grin*). She described how she used little paper hearts as a visual cue to remind them and herself to speak and behave with more respect, etc. For some reason the concept stuck in the back of my mind over several bouts of insomnia and it hit me that the concept could be used in my marriage. Larry and I have developed a really bad habit of putting ourselves down and focusing on our perceived negatives instead of our blessings and good traits, and I had been trying to find tips for changing this behavior for quite a while before I ran across the Creative With Kids post. Although Larry will listen to my ideas or research for improving things he’s not usually overly active with the standard therapy techniques, so I knew I had to use something that would stand out and would force him to take action, so that it would become a new learned behavior. Having to hand out and receive paper hearts would get annoying for us pretty quickly, which meant it was the perfect way to quickly ingrain the new behavior. It also had the additional benefit of being a visual cue, which is helpful to adults too since we have so many distractions and responsibilities that makes it easy to forget little projects, so we had a frequent reminder to be mindful of what we say. 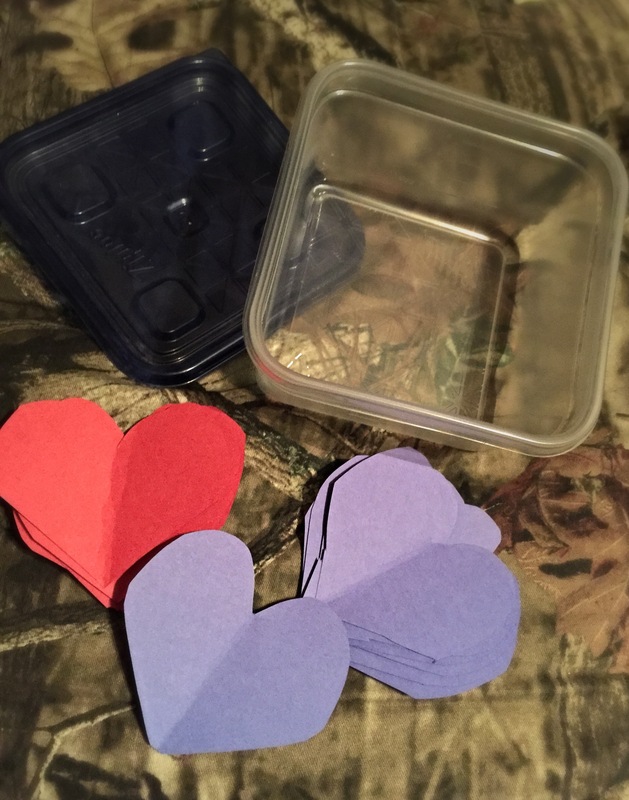 I used a few new disposable leftover containers and cut out a bunch of construction paper red and blue hearts. I set a container with the applicable hearts on the tables beside each of our usual resting spots, plus a collection container across the room so we could track progress (although we really sucked at that part honestly lol). When I said something negative about myself Larry would hand me a red heart or say “here’s a heart” as a verbal reminder, and he received the blue hearts. The act of taking the heart and then having to change what was being said to be more positive made a nearly immediate impact. The best part is that we can be out shopping or at the doctor’s office and can give the verbal reminder without calling attention to ourselves, yet still continue to improve no matter where we are. We still struggle with it and probably always will since we are both very self-conscious people, but it’s a LOT less often. What is even better is that we’re not focusing so much on our appearance and instead focus a lot more on being better people in our hearts. It’s incredibly liberating to release yourself from critiquing yourself, too. When you become accountable for what you say about yourself to others you suddenly see just how emotionally crippling negative comments about yourself can be. Posted in Helpful Info and tagged Accountability, communication, DIY, Marriage, Relationships. Bookmark the permalink.